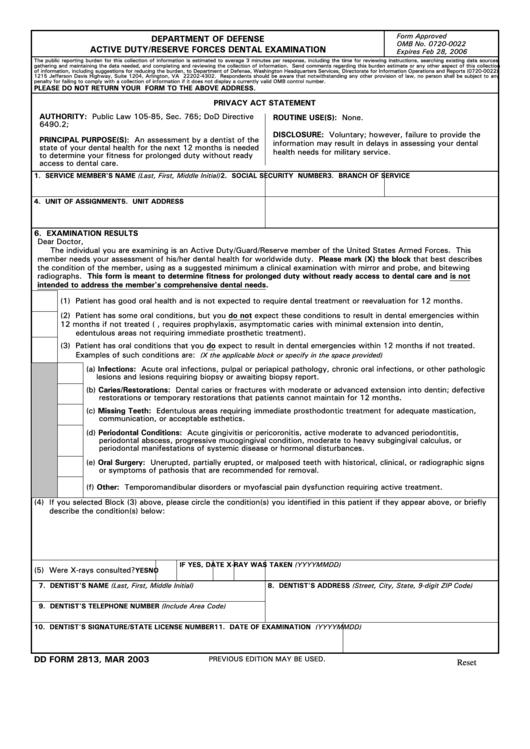 Download a blank fillable Dd Form 2813 - Department Of Defense Active Duty/reserve Forces Dental Examination in PDF format just by clicking the "DOWNLOAD PDF" button. Complete Dd Form 2813 - Department Of Defense Active Duty/reserve Forces Dental Examination with your personal data - all interactive fields are highlighted in places where you should type, access drop-down lists or select multiple-choice options. PLEASE DO NOT RETURN YOUR FORM TO THE ABOVE ADDRESS. health needs for military service. intended to address the member's comprehensive dental needs.